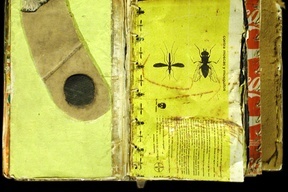 Notebooks, books and manuscripts compiled by Marcel.lí between 1985 and 1993. 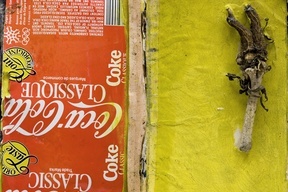 These originals bring together texts, drawings, paintings, photos and collages using unusual materials such as food, dead animals, bodily fluids and rubbish. In Artcagarro Marcel.lí gives free rein to his creative flow. It is exactly the opposite of what the Fura dels Baus required namely elaboration, teamwork and repetition of the work through numerous public performances. Artcagarro exudes immediacy; it displays constant experimentation and spontaneous conceptualization and it reveals his personal method. These books ended up becoming a diary of words and materials from those years. There are more than fifty volumes and they include notebooks of drawings and aphorisms, travel diaries containing materials and objects picked up in the places visited and sequences of manuscripts that form a literary whole when read. Some of the Artcagarro volumes have been displayed in individual exhibitions such as Lotolà (1998) L'Angelot, Barcelona and in several collective exhibitions such as Músicos Pintores and Bibliofilia Transformista.